WPI’s Gordon Library has launched a new platform, Digital WPI, providing global digital access to over 15,000 WPI student projects, theses, and dissertations. WPI student research and projects impact the world in a multitude of ways, and those impacts can extend long after students have completed their work at WPI and its Global Project Centers. More than ten years ago WPI made a commitment to openly – and globally - share all student theses, dissertations and undergraduate IQP and MQP reports through the university’s digital publishing programs. Since then, WPI student theses and dissertations from 2006 to date, and all IQPs and MQPs since 2004 have been made available online. Many universities share graduate theses and dissertations online, but only a few do this for undergraduate research – usually selectively, and often just for honors or capstone projects. WPI is virtually unique in sharing research reports by every undergraduate at WPI, publishing online both the major projects that are completed as part of WPI’s unique curriculum: the IQP, and the MQP. In October 2018, every digital IQP, MQP, thesis, and dissertation became available on a new platform, Digital WPI. This is Gordon Library’s first step in creating a more transparent, media-rich, and functional platform for sharing WPI student work, working in partnership with IT’s Web Application Development & Academic Integration team, and leveraging their new eProjects infrastructure. On the Digital WPI platform, data on the impact of student work is both transparent and visually engaging: anyone viewing a student work can see data on its impact, including document downloads and social media mentions since fall 2018, with a dynamic display using the PlumX application. 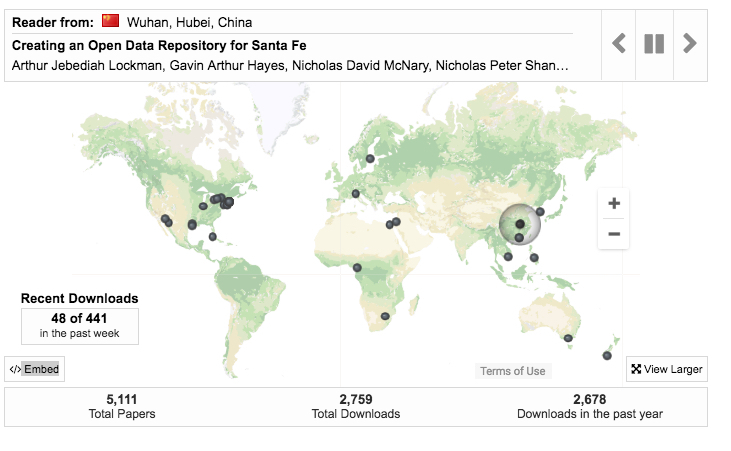 Visitors can also see dynamic global maps showing which student works are currently being downloaded around the globe. WPI faculty can request customized monthly reports on downloads of student works by contacting gr-digitalwpi-dashboards@wpi.edu. Through Digital WPI dashboards, they can now get reports on downloads for individual works, and for student work by department or program. Other WPI staff are also welcome to request access to dashboard reports. In addition to download counts, the dashboards help document the widespread relevance of WPI student work, by showing downloads at individual universities, agencies, institutions and corporations around the world. Potential audiences for WPI student research and projects include current students, prospective students and their parents; prospective employers; WPI collaborators and partners; and educators around the world, who can view student work as evidence of the WPI Plan in practice. The Digital WPI platform has also been combined with Gordon Library’s newly released WPI Library Search discovery engine. Together, they have greatly improved options for searching and finding relevant WPI student work. The Digital WPI platform offers full-text searching for the first time, vastly increasing retrieval of relevant student work by important concepts, names, and places. Digital WPI also supports browsing works by program, department, and by date; and several advanced search options (including by Project Center if noted). Digital WPI can also be used to discover how members of the faculty are engaged in student research, through search by faculty advisor names. By searching for student author names, completed student work across an entire undergraduate (and graduate) career at WPI – including their GPS poster, IQP, and MQP – will be displayed (see this sample author search). An easy way to begin discovering student research is to use the library’s new search engine, WPI Library Search. Simply type your keywords into the library search box on the home page, and choose “Student Projects and Research” from the drop-down options on the right. Result sets can be limited by Resource Type (thesis, dissertation, IQP, MQP), by year, or by other facets from the options in “refine your results” area. In addition to online student projects, theses, and dissertations, WPI Library Search will also find pre-2007 graduate theses and dissertations available in the library’s print collections – all the way back to the first graduate publication, Robert M. Starbuck’s master thesis on induction motors, completed in 1894! In October 2018, during the first full month they were available on the new Digital WPI platform, WPI student works were downloaded 4350 times, by readers in 114 countries. That global reach is real: seven of the top ten institutions downloading WPI MQPs were from outside the U.S.
Gordon Library is partnering with WPI's IT Web Applications Development & Academic Integration team and with campus stakeholders, to bring about several exciting further improvements in access to WPI student work. One of the first of those improvements will be to update current submission processes for student works, streamlining workflows, and incorporating relevant updated policies. Student works at all levels are continuing to evolve. They are taking the form of new visual and media expressions, and include creative outputs such as programs and data. To match WPI’s global publishing capability to these exciting new directions, the Library and IT at WPI are beginning to develop and implement a best-in-class open source publishing platform, using the Hyrax repository platform (part of the Samvera framework used at Northeastern University, Notre Dame, Stanford, and many other major academic libraries). A modern publishing and repository infrastructure like Hyrax will allow WPI to take today’s current improvements in digital publishing to a whole new level of impact that matches the creativity and innovation of our students and the excitement of the WPI Plan. Planning and delivering these new services is being done by a cross-cutting team under the co-management of library administrators (Anna Gold, Lori Ostapowicz Critz and Arthur Carlson), and Bob Brown, who has been leading the eprojects 2.0 initiative. Library experts and IT developers on the project include Aaron Neslin, Alfred Scott, Jayanth Dungathan, Emily Ping O’Brien, and Mark Santiago. Campus stakeholders whose input has helped inform these new services include Associate Dean Kristin Wobbe, Dean Art Heinricher, Dean Kent Rissmiller, Dean Terri Camesano, Dr. Rory Flinn, and Registrar Sarah Miles. For more information, please contact University Librarian Anna Gold, or Associate Director for Library Academic Strategies, Lori Ostapowicz Critz.